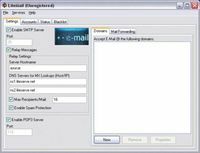 LiteMail is an easy to use mail server that includes unlimited addresses, unlimited domains, forwarding, relaying, SMTP Authentication, a catch-all address and quotas. Integrated DynDNS and No-Ip dynamic DNS clients help make LiteMail a complete and convenient server solution. The administrator is given a precise log of everything that occurs and has the ability to monitor and kill connections.